A quick update to say that the US paperback edition of Osiris was released this week. US folks, you can get hold of a copy on Amazon here or Barnes and Noble here. 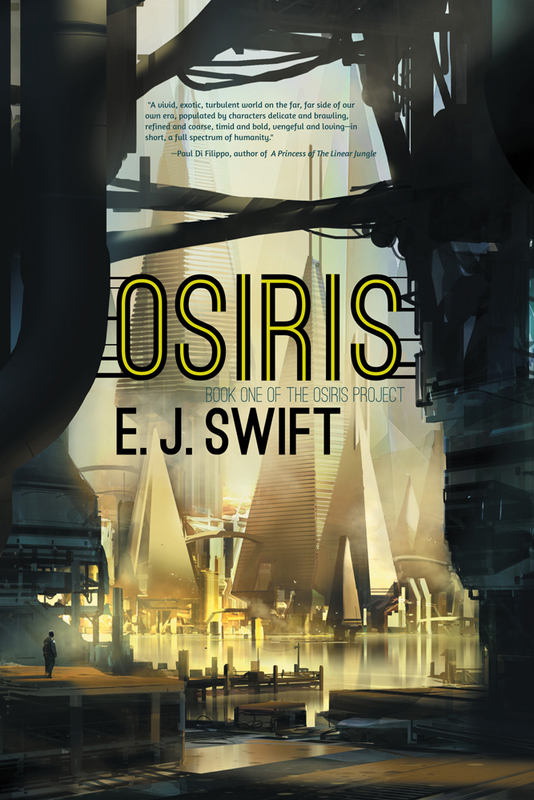 This entry was posted in Night Shade Books, Osiris, Osiris Project on August 14, 2013 by E J Swift. At last an update on the US front – it was confirmed earlier this week that Skyhorse Publishing and Start Publishing have acquired the Night Shade Books imprint. The full press release can be found here on i09. As one of the authors who signed, this means The Osiris Project will now be a part of the new Night Shade/Skyhorse/Start. It’s been a long few months waiting for news, and I’m immensely relieved that we’re now onto the next stage. I have to echo others in saying a huge thank you to Mary Robinette Kowal. She has been an absolute hero, advocating for us on behalf of SFWA and offering her time, energy and expertise to ensure that everyone has had the information necessary to make the best decision in their circumstances. Thanks to Kameron Hurley who set up the discussion forum, to my fellow NSB authors who have been so generous in sharing advice, and to John Berlyne my agent who, as ever, is a voice of sanity (if ever a situation proves why you need an agent, this one does. And incidentally, Zeno Agency has a rare open window for submissions, so if you are at the submitting-to-agents stage, do take a look). Please continue to support Night Shade authors, both within and outside of the new imprint. I’ve discovered some truly wonderful writers through Night Shade, and I very much hope that the new imprint will continue to discover the kind of innovative and dynamic fiction that has made them such an interesting publisher to date. In other news: the May/June edition of Interzone reviewed Osiris, calling it ‘an absolute gem’ which obviously made my month, and next Thursday I will be at the National Maritime Museum to launch The Lowest Heaven anthology with a bunch of quite simply awesome authors. Tickets are free but you have to book (see the website: http://www.rmg.co.uk/visit/events/universe-late) – come and say hello! This entry was posted in Events, Night Shade Books, Osiris Project, Reviews on June 7, 2013 by E J Swift. Communion Town by Sam Thompson. I picked up the lovely hardback edition last year and read the first couple of chapters, or stories, depending on how you view it – the book is described as ‘a city in ten parts’. I’d been reading so many fragmented narratives at the time, I ended up putting it aside and finally got round to reading it properly this year. The writing is gorgeous, with gems of prose shining through even when the voice is deliberately stylised, as in the noir detective chapter. The stories aren’t really linked in the way that, say, David Mitchell does in Ghostwritten, but each one is mesmerising and strangely beautiful and I found myself increasingly hooked the more I read on. Certain chapters will definitely linger with me – the guitarist’s tale, in particular. If you need convincing further, Christopher Priest has a detailed piece on the book over on his website. Tokyo Cancelled by Rana Dasgupta. I saw a review by Nic Clarke which put me on to this and it could very well be the best thing I read this year. Dasgupta uses the framing device of passengers stranded in an airport overnight after their flight is delayed, to tell a kind of contemporary Arabian Nights. It has all the things I love – stories within stories, stunning use of language, incredible invention – but what I really loved about this book was the juxtaposition of a modern, globalised society with folklore and fairytales. So you get call centres in India and daughters locked up in towers; a woman who turns into a department store in New York through the mysterious workings of Oreo cookies. I can’t recommend this novel enough. All The Birds, Singing by Evie Wyld. I hadn’t read Evie Wyld’s first novel so had no idea what to expect. This is a really clever, haunting novel, and a brilliant exercise in suspense. I don’t want to talk about plot because I think it’s one of those that works best if you come to it without knowing too much. Again, beautifully, quite starkly (though very visually) written with an intriguing narrator whose past unfolds in ways you don’t necessarily expect. Currently reading: Light by M. John Harrison. After several chapters of having no idea what was going on, I’m now half way through and really enjoying this one, especially Seria Mau Genlicher, who must be my new favourite character name. Ordered and waiting for delivery of: Spin by Nina Allan and Martian Sands by Lavie Tidhar. Recently acquired: The Panopticon by Jenni Fagan and Angelmaker by Nick Harkaway. Looking forward to all of these. A quick note re Night Shade Books, my US publisher, and the proposed sale to Skyhorse/Start. If you haven’t heard about the Night Shade business, Tobias Buckell has a super-summary of what’s been going on over at his blog. A couple of people have asked me if this has any impact on the UK publication of The Osiris Project trilogy. The answer to this is no: I’m continuing to work on Books 2 and 3 and Cataveiro is currently scheduled for UK publication in September 2013. More updates on the US front when I know more. This entry was posted in Books, Night Shade Books, Recommendations on April 21, 2013 by E J Swift.